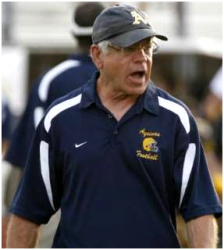 George Smith’s 34 years as Head Football Coach at St. Thomas Aquinas has recorded 361 wins, 66 losses, 6 state championships, 7 runner-ups, Two National Championships (2008 and 2010). He won 24 district titles and had 12 unbeaten regular seasons as well as three perfect seasons. George was the first Florida high school coach to win 350 games at same high school. Smith grew up in Lafayette, Indiana, playing football for Lafayette Central Catholic until graduation in 1966. He also played college football for Butler University for two years before moving to Purdue University and pursuing a degree in physical education, which he obtained in 1971. St. Thomas hired Smith as a history teacher, assistant football and track & field coach, and head wrestling coach in 1972. As a coach of the new wrestling program, he had an overall record of 86-30 over the next seven years, and was the Wrestling Coach of the Year in 1973-74 for the Miami Herald and twice for the South Atlantic Conference. Smith became the head football coach in 1975 and quickly built the program into a powerhouse winning numerous district championships and undefeated regular seasons with one perfect 14-0 season. Smith is a multiple winner of both The Miami Herald and the South Florida Sun-Sentinel Football Coach of the Year awards, and has coached many players who have excelled in college and professional sports, most notable former Dallas Cowboy and NFL Hall of Fame member, Michael Irvin. Smith is the first Florida football coach to register 250 wins with one school. Smith also took on the role of athletic director in 1982. 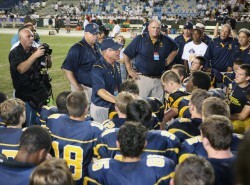 The St. Thomas Aquinas athletic program has won more than 50 state championships during his tenure, and has won its classification in the Dodge Sunshine Cup FHSAA Floyd E. Lay All-Sports Awards each year since it began in 1995. It has been The Miami Herald Athletic Program of the Year for more than 30 straight years, and in May 2005 was designated the third best high school athletic program in the nation by Sports Illustrated. Smith is a 2005 Inductee into the Florida High School Athletic Hall of Fame, a member of the Florida Athletic Coaches Association Hall of Fame and the Broward County Sports Hall of Fame. He is a member of the American Football Coaches Association and has served on its school and public relations committees. Smith is also a popular football speaker across the country.